If you’ve read my blog, heard me talk or follow me online in any way, one thing you know about me is that I love technology. The other thing you might know is that while I always look for opportunities hidden behind the doors technology opens, I also try to be a realist (if not a critic). Out at CES this past week there was a ton of cool stuff announced (and a lot of not cool stuff too). And, once you get past all the talk of VR, AR and digital assistants like Echo, the other big continuing trend was that of the connected car. From features like payment systems built into the dash through fully automated driverless tech, it really does look like the automotive industry is prepared to go all-in with tech innovation and disruption. Of course it all sounds cool, and with two kids in their single digits, I’m already wondering if they’ll ever actually have to get a driver’s license and drive a car on their own. Plus maybe this means someone will finally make the flying car a reality … but it’s also troublesome. As anyone with any familiarity with technology knows, it’s super-fast-moving. Just taking into account Moore’s law, the advancements inherent to technology itself precipitate obsolescence. One only need to look at the difference between a mobile phone in 2007 to 2017 (a year ago right now there was no such thing as an iPhone) and it’s staggering how quickly things can change. Now take a look at the phone you’re using. Are you using that iPhone from when it launched? Or if you’re on Android are you still using your HTC Dream, the first commercially available Android phone … which didn’t launch until October 22, 2008? No. I’m pretty sure you’re not. Now look at how old your car is. It may not be going on ten years old yet, but it wouldn’t be surprising if it was. It’s probably older than your phone. Or at the very least, it’s highly unlikely you buy a new car with the same cadence you upgrade your mobile phone with. And why is that? I’d venture to say it’s because your phone keeps going out of date. Even with new apps and operating system upgrades, the base technology just doesn’t cut it after a few years – so we upgrade. Are we ready to do that with our cars? Keep in mind that just last year the average price of a new car was $33,781 – and that’s without all the new advances in technology that are poised to start being built-in to new cars in the coming years. This is where things get concerning. 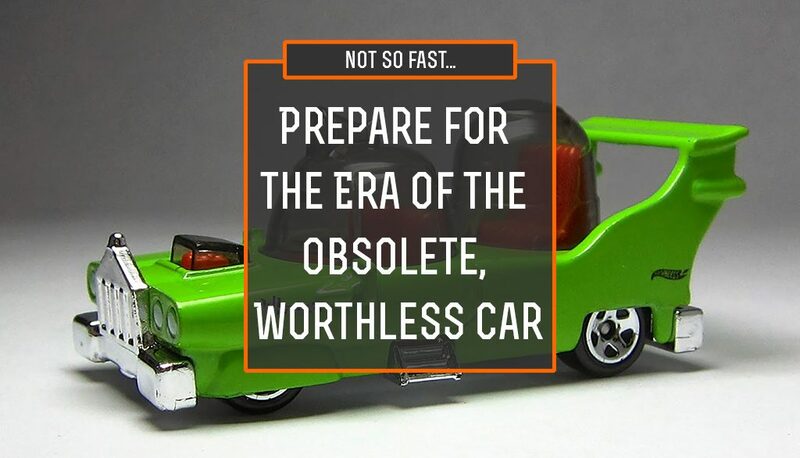 Given the speed at which technological advances occur, it’s extremely likely that technology in a car will be outdated within a few years, and if that technology is one of the main driving factors behind the value proposition of a car, it also means used cars are going to drop in value REALLY fast. Even worse, what happens if something like a driverless car simply becomes unsupported? Is the DOT going to allow unsupported, out-of-date technology to drive around on its own? I have a Dodge Dart. It’s nothing fancy, but it has some technical bells and whistles. In particular it has Dodge’s UConnect system, which while it isn’t going to wow anyone at CES still has a decent amount of features. But it doesn’t work. It used to, supposedly … but now it doesn’t. In particular streaming of Bluetooth has been crippled due to changes in the way the technology is implemented. I can still play music, but I can’t actually scroll my library, nor can I even see the names or artists of what songs are playing. It’s a relatively minor quibble, and one I have learned to live with … but it also causes me to be wary of how much focus automakers put into tech integrations in their cars. After all, automakers are not technology companies. They are used to building out products with yearly models, only to be replaced by new models. Other than safety recalls, they certainly aren’t accustomed to the world of constant support for previous models. You see, in my own example, Dodge could fix the problem. But that would require an upgrade to the UConnect firmware, which they apparently aren’t planning on doing – at least not for my model car. And even if I did want to upgrade, it’s not exactly the easiest thing to do – most people would probably just have to take it to the dealer to have it done for them. So now we’re looking at a $30,000+ investment from a consumer that’s likely to be obsolete almost as soon as they drive it off the lot. I’ve yet to see examples of modular hardware that allows for easy upgrades of core technology in cars, and even software updates aren’t a thing cars are good at. So what good is a connected car five years down the line? I’m not saying there’s no future in connected cars. Not in the least. But what I am saying is that I predict a lot of disgruntled customers a few years down the road who were early adopters, but then can’t unload their early technological marvels for anything near what they paid for them. For some people, that’s fine. It’s the cost of being an early adopter. But how will it affect widespread adoption? And how will it affect our levels of e-waste? Problems for sure. I’m looking forward to hearing more solutions.